Ricotta is an Italian type of cottage cheese. That said, cottage cheese isn't really cheese. Like various "milk products" - feta, yogurt, mozzarella, sour cream, buttermilk and mascarpone come to mind - it fits into a specific category other than that of cheese. This is a question of ingredients but also of method, as most true cheeses (even creamy ones like brie and camembert) are at least slightly aged. Then there is the matter of the source of the milk. Feta is made from goat's milk, mozzarella from the milk of cows or buffalo. Sicilian ricotta is made from sheep's milk, though it is possible to use cow's milk too. Because it is so simple to make, cottage cheese is made in certain parts of Asia and Africa where true cheese recipes are unknown in the local cuisine. So while there are numerous Sicilian cheeses, ricotta isn't one of them. Most cheeses are made from "whole" milk and varying quantities of cream. When boiled, milk, consisting mostly of proteins such as casein, separates into solids and liquids. The liquid is mostly whey, or milk plasma. After straining, the solids, or curds, that remain are primarily casein. Several procedures exist to curdle milk or cream, and it's possible to use rennet or lemon juice, but ricotta is made by simple heating. The word ricotta itself literally means "re-cooked." Ricotta actually contains more curds than whey, and its culinary category is "whey cheese" or "curd cheese." Some milk protein solids (casein) remain after straining, and a bit of salt is added to most ricotta. 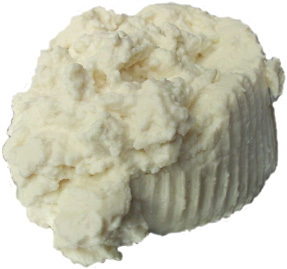 Sheep ricotta, called ricotta di pecora, typically contains from 12 to 18 percent fat. A slightly aged version of ricotta is ricotta salata or ricotta al forno, which is a brick of dense, solidified (pressed) ricotta coated with salt. This effect is achieved by slowly baking and even smoking the pressed ricotta. It is ricotta di pecora that gives the cream filling of cannoli, cassata and sfinci its very distinctive taste. Ricotta made from cow's milk just doesn't have the same flavour. European standards dictate that ricotta must be made in stainless seel vats under specific conditions, but for traditional rustic atmosphere there's nothing like seeing it made outdoors, on a sheep farm. Ricotta is "seasonal," with the best product made during the months that Sicily's pastures are greenest, from November through May, when the grazing sheep produce the most milk. As demand has increased, so has the price of "genuine" ricotta, and much of what is sold in Sicily today, especially during the warmer months, is made from a mixture of sheep's milk and cow's milk. Genuine ricotta di pecora is the real deal.